A couple of weeks ago I was invited by the lovely Lisa of New York Chica to an exclusive event at Rustico’s Cooking School (NYC) – “Salad Night Live” with Tyler Florence”! I love all things food, especially healthy food so I went for it. I stood and watched, admiringly, as Chef Tyler Florence, chopped, sprinkled, marinated, and grilled the selected items of the night. 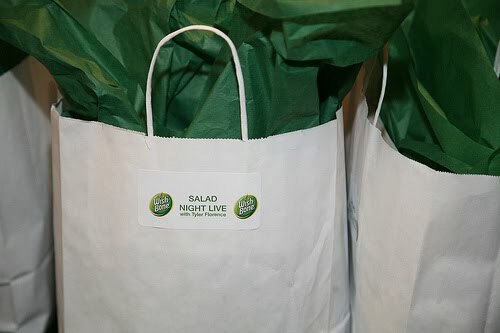 Hearty salads accompanied by Wish-Bone® salad dressings are a favorite in my house. 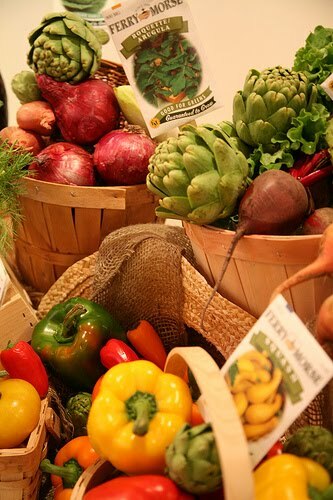 We love protein filled salads such as the one Tyler Florence demonstrated to us below…. 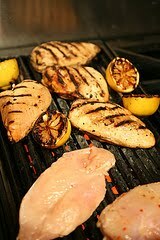 4 large boneless, skinless chicken breasts (about 1-1/2 lbs.) 1-1/2 cups Wish-Bone® Italian Dressing, divided 4 lemons, cut in half 1 red bell pepper, sliced into thick strips 2 cups panko bread crumbs 1/2 cup flat-leaf parsley 1/4 cup extra virgin olive oil 1 clove garlic, minced Kosher salt and ground black pepper 3 heads romaine lettuce hearts, quartered lengthwise. Add chicken and 1 cup Wish-Bone® Italian Dressing in large resealable plastic bag; turn to coat. Close bag and marinate in refrigerator 1 hour. Remove chicken from marinade, discarding marinade. Heat large nonstick grill pan over medium heat and cook chicken, turning once, 15 minutes or until chicken is thoroughly cooked. Grill lemons and red pepper, turning once, 5 minutes; set aside. Pulse bread crumbs, garlic, parsley, olive oil and salt and pepper in food processor several times until crumbs turn bright green. Spread crumbs on baking sheet, then bake 7 minutes or until crispy. 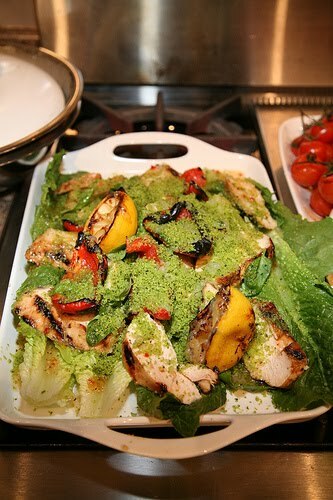 Arrange lettuce on large platter, then top with grilled chicken and peppers. Drizzle with remaining Dressing. Sprinkle with some of the toasted bread crumbs, reserve remaining crumbs to use another day. Then squeeze grilled lemons over salad. Garnish, if desired, with parsley. If you would like to take part in this giveaway, just read below…. its easy. The randomly selected winner will receive a Gift Bag filled with goodies provided by Wish-Bone® along with a signed copy of Tyler Florence’s cookbook “Dinner At My Place”. Leave a comment on this post telling me what your favorite Wish-Bone® salad dressing is and why. That’s all! You can find a variety of dressings here. This giveaway ends June 11, 2010 11:59 P.M. EST. The winner will be chosen randomly on June 12, 2010 and will be notified via email. You can find more recipes by Tyler Florence at Wish-Bone. **Disclosure: All Wish-Bone® salad dressing opinions are my own. I was not given any monetary compensation to provide any of the above opinions.